While mainstream media entertains and distracts many Americans with the Donald Trump circus of idiocy, our planet is literally burning to the ground. Though there are a great many anthropogenic factors related to the record number of fires that are incinerating what is left of the Earth’s boreal forests, the most significant factor of all still goes completely unacknowledged by the climate science community and mainstream media, global climate engineering programs. Geoengineering is inflicting record drought around the globe (along with deluge in other locations), destroying the ozone layer, and contaminating soils and waters. Climate engineering is the greatest assault against the natural world ever unleashed by the human race. All are needed to join the fight to raise awareness of this most critical issue. When we reach critical mass, we will have a chance of stopping the insanity in our skies. The article below is the latest update from the front lines of our burning forests. 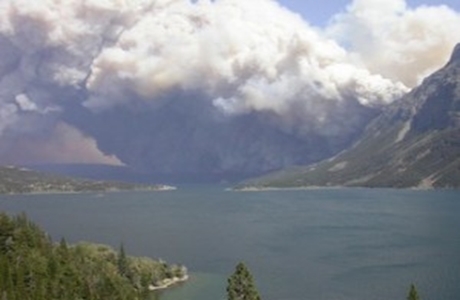 At the beginning of this month, 314 wildfires were raging in Alaska alone. They have seared 5 million acres so far this year and have torched up to half a million acres in a single day. Meanwhile, to the east in Canada’s Northwest Territory, hundreds of fires were raging in the permafrost zone, having covered over two million acres by the end of June. The forested northern provinces of British Columbia, Alberta and Saskatchewan were similarly afflicted — 522 fires in northern Saskatchewan alone by June 30, nearly four times as many as last year in the same period. Southward from Alaska, at the beginning of this month, wildfires dotted the landscapes of all the western states as far south as southern California and as far east as Colorado. One California fire overran a traffic jam on a freeway, leaving behind a dystopian landscape of burned-out cars (but, remarkably, no serious casualties). 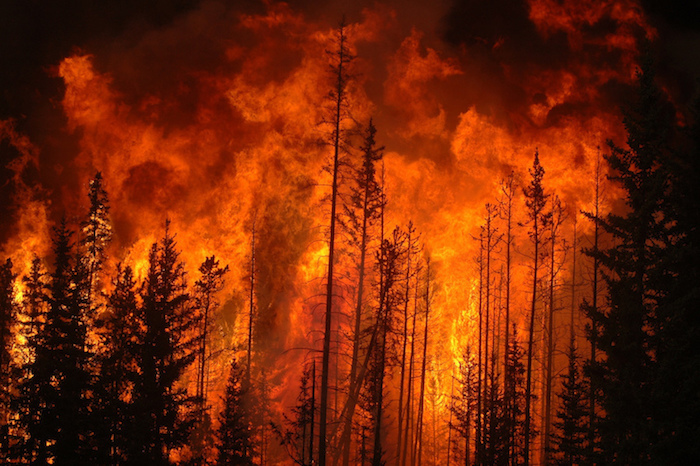 Wildfires were raging across southern Siberia and Inner Mongolia by mid-April. At the moment, more than 50 wildfires are burning in troubled Greece, their smoke casting a dark pall over Athens. A new study published last week confirms that wildfires worldwide are larger, more numerous, and their season is longer every year; and that it is all a direct consequence of climate change. Hotter and drier conditions, beginning earlier each spring, have over 30 years doubled the area of the planet’s surface that is vulnerable to wildfire; and have lengthened by 18% the average length of fire seasons worldwide. In addition, climate change has extended northward the range of the mountain pine beetle, which has killed swaths of western pine trees so vast that there is fear of a single wildfire sweeping through dead trees from New Mexico to Alberta. The effects of these fires go far beyond the immediate danger to homes and persons. Wildfires do not “destroy” the land across which they travel, as is often heard in the lamestream media, fire is an integral and necessary part of natural ecosystems. However, massive fires temporarily denude the land they scorch of the leaves that deflect and slow rainfall, and the root systems that hold topsoil in place. Thus muddy floods and landslides follow the fire until undergrowth is replaced. The smoke from these titanic fires is becoming a major threat. It contains tiny particles that bypass the body’s defenses against pollution and enter the lungs and bloodstream, aggravating lung and heart diseases. Fire 50-100 miles upwind from a city have been shown to degrade air quality by a factor of 5 – 15 times. Carried into more southerly latitudes by the undulating planetary wave between the polar and temperate air masses, the smoke has been darkening the summer skies and tinting sunsets as far south as Tennessee and West Virginia. But the most ominous thing about these fires is that they are not merely an effect of climate change, they are a cause. The burning of the forests and tundra is releasing astounding quantities of carbon, stored for centuries in the wood and the permanently frozen subsoil. Melting permafrost releases methane, a greenhouse gas many times more destructive of the world’s climate than carbon dioxide. The fires are in fact a feedback mechanism, accelerating climate change as climate change accelerates them.